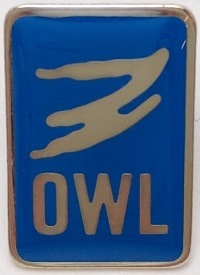 Our Whole Lives (OWL) Recognition Lapel Pin in blue, for grades 7 through 9. This pin is suitable for presenting to those who have completed the Our Whole Lives program for grades 7-9. It features a convenient butterfly clasp.